I do not know who this women is in the center of the photo below, but what I do know is that she is a fighter. 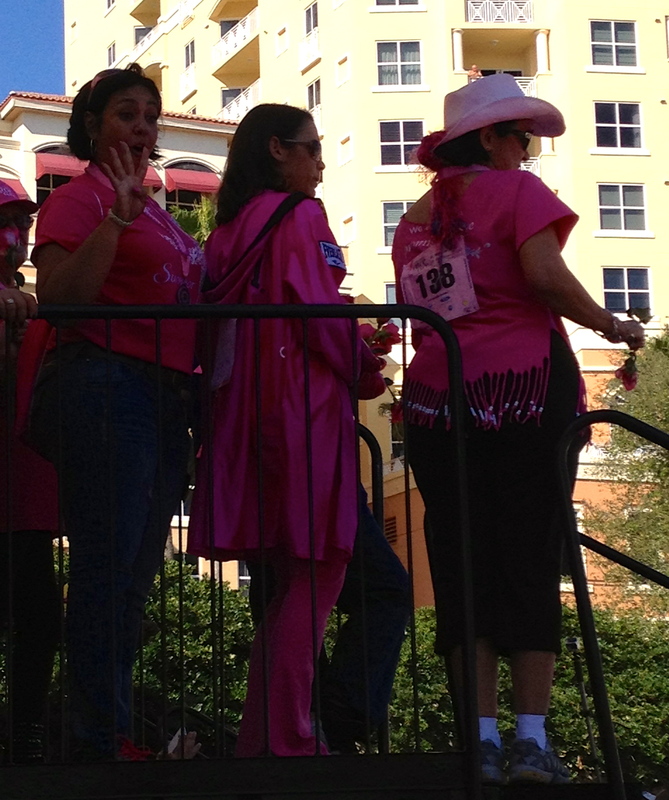 She attended the Susan G. Komen Race for the Cure in a bright pink Everlast boxing robe with matching hot pink gloves. On the back of her robe she had a sign attached stating that she is a two time breast cancer survivor. It was obvious how proud this young woman was of her journey and where she stood today. At the Race for the Cure they have a processional of all the survivors. You look out to a sea of pink and watch the survivors proceed to the stage. Once they get up there everyone dances and sings. The Everlast woman was having a great time; she was so happy and free. Every year this ceremony pulls at my heart strings and makes me proud of each and every survivor and what they have endured. Every year I learn something new from these amazing men and woman. Amour is a love story about two retired music teachers and how their endless love is tested when one of them has a stroke. It is a beautiful emotional film that shows the dedication and love these two people have for each other. The style in which the film is directed allows for pauses during mundane daily routines. It is a great reminder to take a pause during our day and even more so while we are completing a routine task. Emmanuella Riva, who is 85 years old and plays the wife, has been nominated for an Academy Award for best actress. The movie is up for several additional Oscars. It is definitely worth seeing. Emmanuella, the Everlast woman and all the other breast cancer survivors inspired me this weekend. They are dedicated, work hard, and are fighters. What or who has inspired you lately? As always, I would love to hear your comments. And all of you inspire me. Funny Katarina,you read my mind! And I’m not just saying it.I mean it. What blogs are you currently following? What a powerful entry. Great way to start my day…thank you! YOU inspire me to look within and be that person who is willing to take a risk whether it be trying a new recipe on friends; stepping outside the decorating box and trying something different; accessorizing and mixing up fashion patterns/colors; and generally taking a risk in life because that is the best way we learn. Thank you for such awe inspiring posts!!! You are the most fashionable and creative woman I have ever met, naturally you are my inspiration. I have looked up to you and everything you do since I was a little girl. Love you Libbs! A great friend blogged about her journey with breast cancer last year and I wanted to share it with you after reading your beautiful post about what inspires you. I hope to cross paths soon.